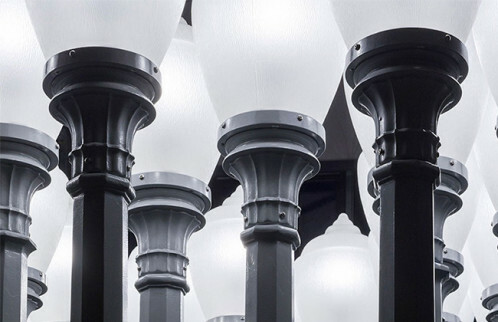 Gagosian Gallery New York is presenting a show with the last Chris Burden. The American artist is know for his extreme art experiences implying body arming as with ‘Shoot’ (1971) or money making such as ‘DIECIMILA’ (1977), a facsimile of an Italian 10’000 Lira note. 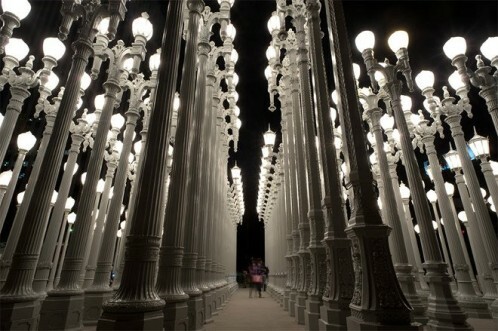 The new show, ‘Buddha’s Fingers’ evokes the fronting LACMA Museum artwork ‘Urban Light’. Buddha’s Fingers is responding to the same principle as the famous ‘Urban Light’, an installation of 202 restored street lamps of the 1920s, nowadays seen as a Los Angeles icon. The Buddha’s Fingers named after the eponymous-fingered citrus fruit, is composed of thirty-two antique cast-iron vernacular street lamps. By reactivating found objects into art, Chris Burden embodies his saying that “It’s about trying to frame something. And draw attention to it and say, ‘Here’s the beauty in this. I’m going to put a frame around it, and I think this is beautiful.’ That’s what artists do. It’s really a pointing activity.” Already discussed but aborted in 2003, the show is now taking place until mid February.